and they get angry with you because you won’t give them the rules. The thousand techniques are inferior to the one Principle. John Howard Lawson (1894 – 1977) was an American playwright, screenwriter and theorist. Avowedly left-wing (he was head of the Hollywood chapter of the Communist Party USA and testified before the House Committee on Un-American Activities in 1947), Lawson was an early president of the Writers Guild of America (an interview on the subject here) and years later was one of the blacklisted Hollywood Ten. Author of numerous Broadway plays and Hollywood screenplays, his publications include Film in the Battle of Ideas (1953) and Film: The Creative Process (1964). More on Lawson’s life and work here and here. Theory and Technique of Playwriting and Screenwriting (in which Lawson cites Aristotle and Archer) is especially useful for students of dramatic construction, describing what Lawson calls “The Cycle of Conflict” and the differences between “activity” and “action” (or, to put another way, between a “situation” and a “story”). Having been published decades ago, all four of these texts are, to a certain extent, somewhat antiquated, using occasional examples of plays and films (and authors and filmmakers) that contemporary readers are likely unfamiliar with. But they are nonetheless expertly written pieces of prose, full of perennially important ideas that can be endlessly mined for useful guidance when it comes to narrative screenwriting. 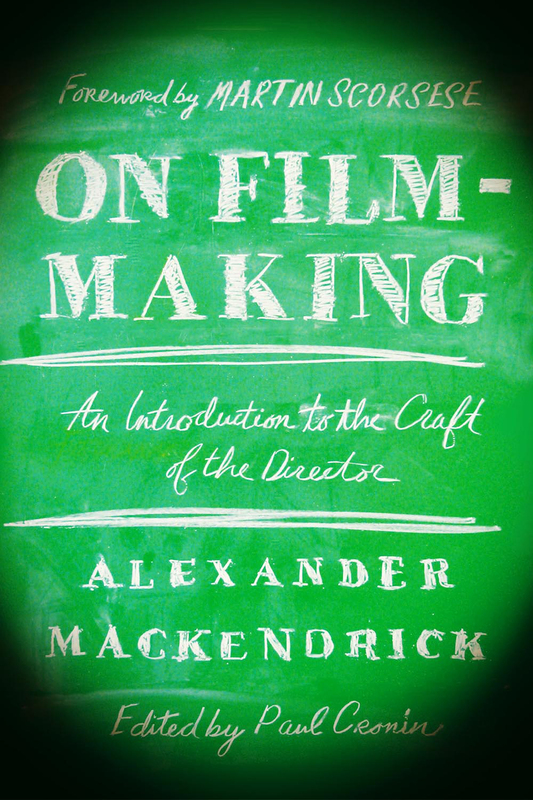 Before jumping into all this reading, take a look at this two-hour extract – specifically about story – from the audio/visual project Mackendrick on Film, which was produced to accompany On Film-Making. For a complete set of clips, go here. Mackendrick knew that however much he implored them to do so, most of his students would never read these books, which is why he prepared summaries of two of the four. A version of Mackendrick’s Aristotle handout, which contains a wealth of extracts from Poetics, is here. Two translations of the complete Poetics are available online. Here and here for Butcher. Here for Bywater. Here is a modern translation by Hammond. Kenneth McLeish’s translation and short book about Aristotle are both well worth reading. Mackendrick’s handout on William Archer, which contains a handful of valuable extracts from Play-Making, is here (a shorter version appears in his book On Film-Making). Archer is particularly good on explaining the key notion of “point of attack” (see here). His book can be found in its entirety here and here. Extracts (as compiled by Paul Cronin) from Egri’s The Art of Dramatic Writing - which is a bit long-winded, and many pages of which are taken up with details of specific examples of existing works of drama that you might not know about or be terribly interested in, and has lengthy sections written in a Q & A format (if you like that kind of thing) – are here. Extracts (as compiled by Paul Cronin) from John Howard Lawson’s Theory and Technique of Playwriting and Screenwriting are here and here. The entire text of the book is here. Lawson’s other books Film: The Creative Process and Film in the Battle of Ideas are available here and here. Theory and Technique of Playwriting, Lawson’s 1960 book, is here. All texts by John Howard Lawson appear here courtesy of Jeffrey Lawson and Susan Amanda Lawson. Here for an extract from Mackendrick’s On Film-Making relating to dramatic construction. Here for a glossary of dramatic jargon, as drawn from Mackendrick’s writings. 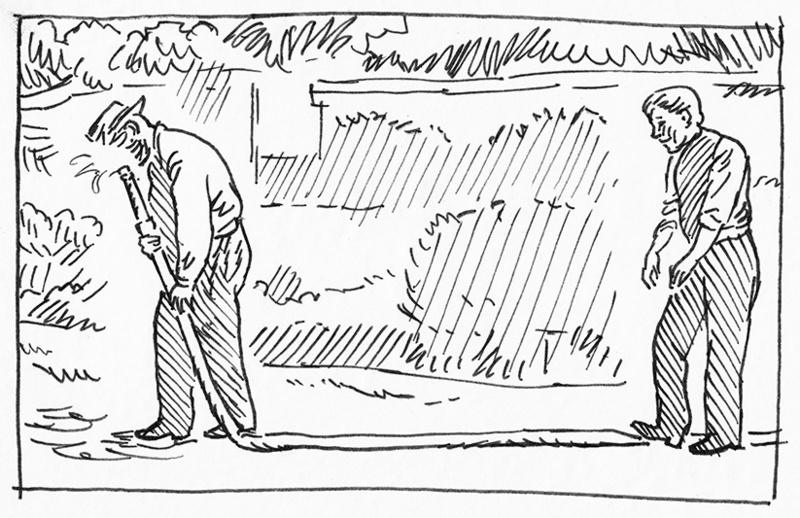 Here for a selection of step outlines, some written by Mackendrick. Here for Mackendrick’s Slogans for the Screenwriter’s Wall, which serve as something of a summary everything contained on this page and more. Here for some of Mackendrick’s exercises for students of dramatic construction. (as compiled by Paul Cronin) of Mamet’s thoughts on the subject (and also his pertinent ideas about filmmaking, not least his articulate description of Eisenstein’s theory of montage). Here for Mamet’s Paris Review interview from 1997, which contains insight upon insight. Another good interview here. Include into the mix the work of perhaps the best-known screenwriting teacher working today: Robert McKee. No great writer himself, McKee knows enough to borrow from the best, and his book Story is full of good ideas taken from Aristotle and Lawson (both are cited in the bibliography). (N.B. : stay away from his second book Dialogue.) Here for some McKee-isms. Here for an article that contains useful background information about McKee, and here for a critique of his way of doing things. Someone cited by McKee in his book is Kenneth Thorpe Rowe, a professor at the University of Michigan (where he taught Arthur Miller), whose A Theater in Your Head contains useful ideas. Here for a handful of pages from that book. This (adapted from a 2014 book) is solid stuff. See John Yorke giving a lecture here. He isn’t wildly inspiring, but his ideas are useful ones, especially for beginners, including his “Ten Questions” designed to get any screenwriter out of trouble: (1) Whose story is it? (2) What’s their flaw? (3) What is the inciting incident? (4) What do they want? (5) What obstacles are in their way? (6) What’s at stake? (7) Why should we care? (8) What do they learn? (9) How and why? (10) How does it end? Those with more of a theoretical inclination who are seeking to learn more about story structure and filmmaking should take a look at the work of David Bordwell and Kristin Thompson, specifically their books Narration in the Fiction Film (1985), Storytelling in the New Hollywood: Understanding Classical Narrative Technique (1999), Storytelling in Film and Television (2003) and The Way Hollywood Tells It: Story and Style in Modern Movies (2006). At times somewhat arcane, the Bordwell/Thompson texts are nonetheless worth close study, for much practical information can be extracted from them. Bordwell and Thompson also maintain a voluminous website. Dig into pages like this one, or here, then move methodically through the links, and it may be some time before you reappear from cyberspace. There is, inevitably, a continuity of thought running through these texts and, indeed, all competent articulations of the most fundamental principles of dramatic construction, and it’s worth noting that to a great extent, Aristotle, Archer, Egri, Lawson, Mackendrick, Mamet, McKee, Rowe, Yorke and Bordwell/Thompson all say the same things. One might even go so far as to paraphrase Alfred North Whitehead: all writings about dramatic construction are a series of footnotes to Aristotle. You could select any three of these names, ignore the others, and probably not miss anything radically important. In his 1948 book The Human Nature of Playwriting, Samson Raphaelson recommends that students “go to the library and find a book or two on dramatic technique. I don’t think it matters too much which book. Each book has its friends and its enemies among teachers, and I propose that you explore for yourselves.” It’s a good way of thinking about this subject, because there are texts about dramatic construction that I either don’t know about or don’t particularly appreciate, but that work for you, and however imperfectly I might think those books represent the key principles, it’s probable that they do cover the basics and will serve as a good starting point for you. There’s no point in me pushing John Howard Lawson on you if it’s nothing but meaningless jumble. Pick up a different book instead. Or take a completely different approach, and by do doing, learn it all your own way. Frances Taylor Patterson, author of one of the earliest studies of screenwriting practice – Cinema Craftsmanship (1921) – put it well in her 1928 book Scenario and Screen: “An actor tells the story that a friend of his, knowing that he was ambitious to write a play, sent him a copy of William Archer’s Playmaking. When he began to delve into the principles of stagecraft laid down by Archer, he realized that he had learned most of the theories from knocking around the theater over a period of years, playing all sorts of parts and learning all sorts of things by bitter experience. He and Mr. Archer arrived at the same conclusions, but by different routes.” Of course, much of what you might come to absorb from books and practical experience is likely to be wholly commonsensical, things you knew instinctively, without even thinking about them. All that said, the ideas on this page are merely guideposts, presented to help you see the bigger picture, to provide you with a toolbox into which you can reach when you run into trouble while writing, to assist you in identifying, diagnosing and, ultimately, remedying problems with your work. As Mackendrick explained, his teachings and student handouts “mean nothing when they are first explained. They mean something when they can be related to an immediate and specific problem in what the student is currently working on.” So what you have here on this page isn’t the be-all and end-all of anything when it comes to the theory behind cinematic storytelling, nor even the classical narrative tradition (which has always only ever been just one way of doing things). It’s merely a collection of ideas worth thinking about, absorbing and understanding, then probably moving beyond. The fact is that after reading everything above, doubtless you will be able to think of a multitude of excellent films that appear to correspond in absolutely no way to some of the most basic concepts of dramatic construction, and yet keep audiences thoroughly entertained. As it should be. After all, the trick as a storyteller is to absorb the principles and, by doing so, find your own unique techniques, your own way of doing things. The learning curve kicks in when you start exploring how each film you watch works within the “rules,” how some subvert them creatively, how some apply them with either rigidity or subtlety, how some fail at every turn. In The Art of Photoplay Making, published in 1918, Columbia University screenwriting instructor Victor Oscar Freeburg explains that the writer must construct their story “as deliberately as if he were the architect of a house. An architect has to recognize and obey certain unchanging laws of gravitation, equilibrium, tension, and stress. He has no choice in the matter. He cannot alter, ignore, or repeal these laws. In the same way the author must recognize and obey the laws of the human mind, laws which have not changed since the world began. People become interested, pay attention, get excited and calm down, remember and forget in exactly the same way today as when the first savage told a story or scratched the rude picture of a beast on the wall of a cave.” It’s understandable why so many people appear to be resistant to things like “rules” when it comes to creative writing, but I nonetheless find it hard to disagree with Mr. Freeburg on this point. “Dramatic Construction” was the name of one of two classes Mackendrick taught for several years at CalArts (and also of one of the two sections of On Film-Making). 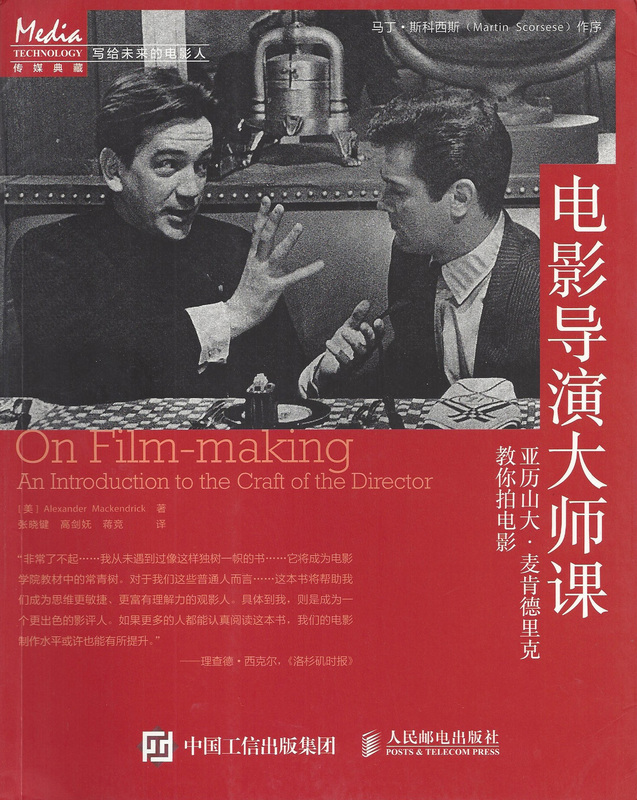 The other was “Film Grammar,” the basic tenets of which can be gleaned from two of the most important books ever published on the art and craft of filmmaking: Film Technique by Vsevolod Pudovkin (extract here) and Film as Art by Rudolf Arnheim, both of which were strong influences on Mackendrick and his conceptual understanding of cinema when it came to his thinking as a teacher. The books are available here and here. Why is a consideration of film grammar so important to the student of dramatic construction? Because form can never be entirely separated from content. Writing for the cinema requires an understanding of how it functions as a storytelling medium at the most fundamental level, which is through images, not words. Here for Mackendrick and others discussing film grammar. Creating a character relationship map for your story – and by so doing making clear the interconnections between your fictional creations – may help you understand what tensions potentially exist between them (i.e. what is driving the story forward) and in which direction the narrative might usefully move. The condensed version of all this comes from John le Carré, who offers up a good starting point when it comes to determining what is a SITUATION and what is a STORY: “‘The cat sat on the mat’ is not a story. ‘The cat sat on the dog’s mat’ is a story.” If you’re still lost after that, fairy tales are a good place to start. “Write from experience” is the worst piece of advice ever offered in a screenwriting class. For God’s sake, use your imagination. On that note, probably better to stay out of school altogether. Explains David Mamet: “Education is the worst thing to happen since kale.” If you are, for whatever reason, shackled to education, remember to think for yourself. Nobody knows anything. Kenneth McLeish: “Aristotle’s conclusions were never meant to be prescriptive; they were, rather, a summary of all evidence so far available, with conclusions drawn from it. In his view, new material and new evidence were constantly appearing, and theories should be modified to take account of them. His surviving works – about one-quarter of the total attributed to him – are not finished treatises so much as interim reports, often in the form of notes and containing accumulations and accretions of material made over many years.” The same could be said for all the writing cited above. Mackendrick wrote of Pablo Picasso that he “demonstrated a complete command of figurative painting before he went on to reinvent the language of visual art.” Apparently Picasso would explain that “Art is not truth. Art is a lie that makes us realize truth, at least the truth that is given us to understand.” We have much to learn from anyone who created these two images. As you embrace the terrors of the blank page, an antidote to all this mishegas is here.